This building has two completely separate sections and both have a new interior as of 0.60. They can be identified by their differing door colors: blue on one side, and red on the other. 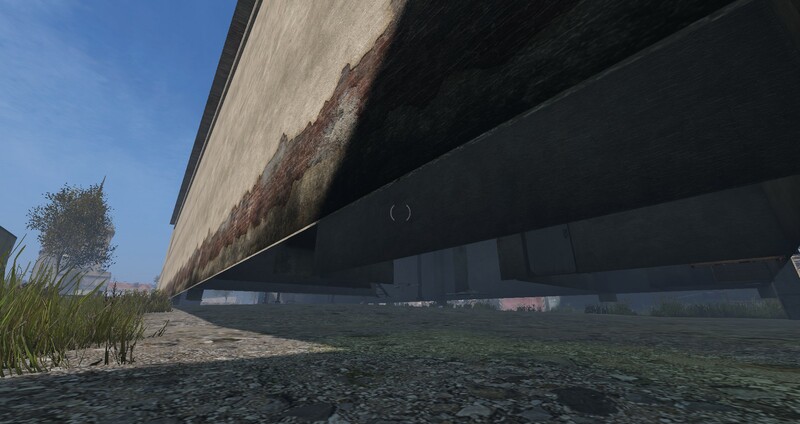 Besides the cement factory and silo buildings which are nearly skyscrapers, this is one of the larger industrial assets in Chernarus. It features a main room with a walkway over a pool of some sort, bathrooms, and a break room. Looking very simple on the outside, this building actually contains a fairly elaborate interior. It has a large main room with ceilings several stories high, some smaller side rooms, and roof access via a ladder on the second floor. This building gained an interior in 0.59, but it has been re-done for 0.60 with some small but noticeable changes. It has gained a proper skylight where before it had a plain ceiling, but it has also lost a side room which is now boarded off. A collection of photos showcasing buildings that are now enterable as of 0.60 that had no interior previously. NOTE: This album does not cover new buildings added in 0.60 which did not exist before. Awsome work as always tatanko !! Once the 100% enterable building reached i hope they will rework all the houses of the map and maybe add some enterable rooms !!! Thanks! I think the tan/aqua building is awesome. Siempre espero tus aportes ¡gracias por compartir! Roof Access in the Tan/Aqua High-Top Industrial Building is nice. Yeah! You can access the roof on both sides, there’s only one way in as far as I can tell, and you have a great view of the inside of the building too. The roof access part with the windows looks like an excellent defensive position. Pretty comfy-looking too. The only thing that hurts my eyes is that the buildings are so empty and clean. I hope later they will make them look more post apocalyptic. More objects inside would help with that a lot, I think. The lighting effects look good!